* Father Oliver Holt OSB, lifelong friend, read English Literature at Oxford with Nicholas. A study of every complexion of monastic order present in medieval North Yorkshire with a Benedictine monk as our guest lecturer; a retreat format with morning lectures followed by short journeys from one soaring ruin to another: including the Carthusian Mount Grace Priory, the Augustinian Guisborough and the Cistercian Rievaulx (1132), the Benedictine Whitby. 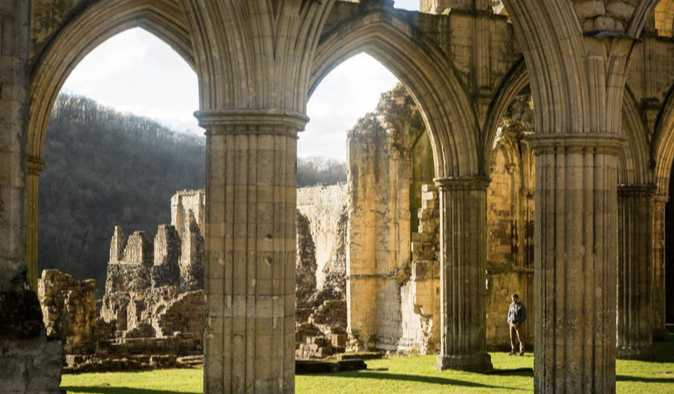 In the evenings we offer excerpts from the writings of the principal ecclesiastical players to include St Augustine, St Aelred at Rievaulx, the poet Caedmon at Whitby, the Scropes family at Easby, and others. An elegant Yorkshire hotel in the former home of the Ellis family. Set in private grounds in the village of Scalby near Scarborough on the edge of the North York Moors National Park, Wrea Head Hall offers superb food and service. All lectures, tuition, and ‘pastoral’ care, private visits, entries, and transportation during the tour, three nights accommodation with breakfast, lunch and dinner with wine, all coffees and teas. £1225 members, £1275 non-members, £135 single room supplement, deposit £250. Please note that this cost excludes train tickets to and from York.